Q. I fell in love with your art when I read your book, Mountain Chef: How One Man Lost his Groceries, Changed his Plans, and Helped Cook up the National Park Service. How did you come to illustrate the book? How long did it take to develop and complete the illustrations? What medium(s) did you use? I was contacted by Charlesbridge last fall about illustrating the book. They liked the watercolor technique used for Father’s Chinese Opera. It was a technique I had used on a couple of projects commissioned by Great Books Foundation 2010. It took about two weeks to create the sketches from the manuscript and about 30 days to complete the finished art. The media are pencil and watercolor composed digitally. Q. What do you mean when you say the publisher used ‘spot varnish’ on your illustrations? Where was it used on your book, Mountain Chef, and how does it help ‘pop’ the illustrations? Spot varnish is a printing process used to highlight areas of emphasis. In the book Mountain Chef, the varnish was used on the artwork. If you look closely, you can see a slight sheen over the illustrations. The publisher also used quality semi-gloss white paper stock. The combination resulted in rich colors throughout the book. Q. As an accomplished artist in your own right, how did your journey take you to illustrating children’s books? In 2012, I was emailing out samples of my work one night on the internet. One email was answered. It was from Anna Olswanger, a literary agent working out of NYC. She asked “I know you can do great art but can you write text?” Without hesitation, I said yes. I had no experience. In about 6 months, she chose 1 of 9 vignettes loosely based on childhood memories when I lived in Hong Kong. Layouts were created into a presentation. She sent the text with three color illustrations to the editors. We agreed on the terms with Sky Pony Press in 2013 and Father’s Chinese Opera became my first published book in 2014. Q. For your first book, Father’s Chinese Opera, you won the 2014-2015 Asian/Pacific American Award for Literature in the Picture Book Category. How did you come to write the story? How has that award on your first picture book impacted your life? I lived in Hong Kong for the first 6 years of my life. Father was a famous opera composer and a conductor. I was too young to be in school, so he often took me to work. I met all the actors and acrobats and sat in on rehearsals and performances. Those were happy times, so it was easy to visualize. I used my imagination to create the scenes and wrote text to describe them. It was the right process for me. The award was unexpected. It is an accomplishment like nothing I’ve ever experienced. It gave me confidence to write and illustrate more children’s books. At a book talk at the Chinese American Museum Chicago, I honored my parents as heroes of my life. It also validated for me that miracles can happen. Q. How is creating picture books changing your life? It adds another dimension to my repertoire. The picture book industry provides a stage for creativity. As a professional artist, you want to extend and build skill sets to be better. I was fortunate to be invited to the ALA (American Library Association), participated in an award ceremony in San Francisco and the Book Expo in Chicago in the last two years. These are incredible experiences and are not to be taken for granted. Q. Your first book was inspired by your father’s work as a composer, so you were born into a creative family. Was your artistic interest always supported by your family? How has their support helped? When did you know you were going to be an artist? Growing up in a pragmatic Chinese American culture, the arts are not always looked upon as valued professions. I followed my passion and worked hard to develop an artistic life and career. Raw skills are refined and imagination cultivated. With strong fundamentals and a lot of luck, I was able to make a living and raise a family with the earnings from the artwork. Q. Do you do classroom visits? If so, what is the response of the children? Yes, I do. The children are more fascinated by the illustrations than by the story itself. I am learning how to make the artwork even more interesting for children. Q. Earlier, you were commissioned to illustrate stories by Ray Bradbury and Langston Hughes, among others. What was it like for you to create visuals for some of these great writers? Did you immediately see images as you read their words? It is a privilege to illustrate for any author, but the great ones are icing on the cake. I do see imageries as I read. Keywords are used for initial ideas. Compositions are refined and techniques chosen to fit the story. I am blessed to be able to explore and then perfect techniques on projects. Q. Do you have any more books coming out soon? Where can people find out more about you? 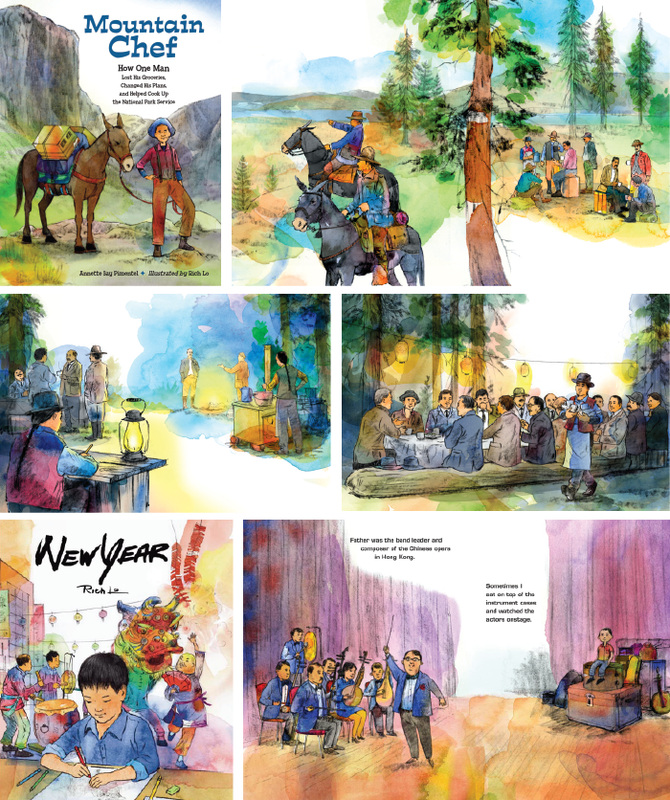 A picture book titled New Year, published by Sky Pony Press, will be coming out in November 2016. This entry was posted in Ages 4-8, Art/ Artist, Author Interviews, Awards - Other, Uncategorized on November 5, 2016 by admin.